Text Alert is used to get short, immediate messages out to registered users who have an interest in helping PSNI and PCSP to reduce crime and help keep the community in which they live or work safer. A key challenge facing Mid and East Antrim PSNI and Policing and Mid and East Antrim Policing and Community Safety Partnership (MEA PCSP) is how we can engage and communicate better with the communities we serve. Mid and East Antrim Borough Council / MEA PCSP and the PSNI have listened to the concerns of the community particularly in our rural areas and they have told us that we needed to address how we can communicate information to them. Not all citizens have access to or are comfortable with social networking platforms which many statutory, voluntary and community organisations now use to deliver key messages and information to their members. 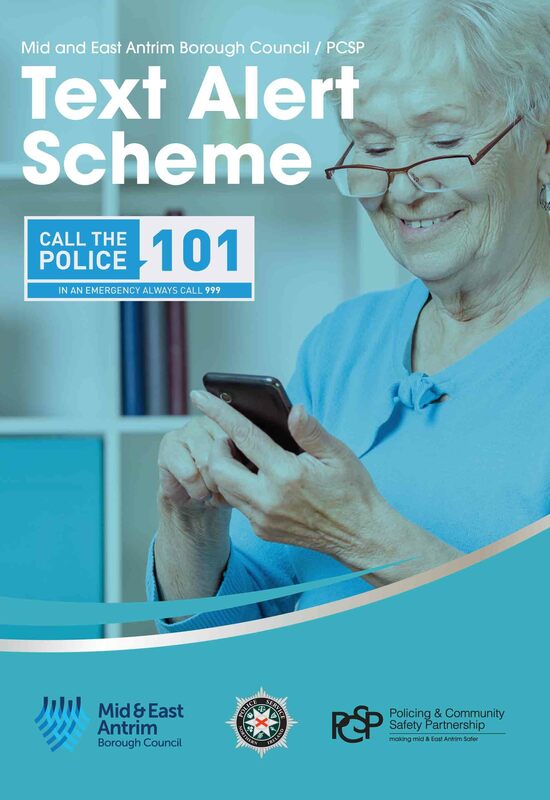 MEA PCSP in conjunction with their colleagues in the PSNI have developed a Text Alert system which will allow them to communicate directly with citizens of Mid and East Antrim Borough Council who sign up for the scheme by SMS text message almost instantaneously if there is an issue in their area. Members of Mid and East Antrim Borough Council / PCSP Text alert scheme will receive an SMS message to their mobile phone with relevant community safety information in their area. Text Alert is used to get short, immediate messages out to registered users who have an interest in helping PSNI and PCSP to reduce crime and help keep the communityin which they live or work safer. Text Alert can also be used to remind them of dangerous road conditions, suspicious vehicles, ongoing crime issues in the registered users particular area. Registered users will only receive a Text message from the Mid and East Antrim Borough Council / PCSP or the PSNI. Your mobile number will not be shared with any other external body or organisation. Your information will be held securely by two named data controllers from Mid and East Antrim Borough Council / MEA PCSP and the PSNI. You can securely sign up to the scheme online below or download the form and follow the instructions as directed. Project you are interested in? I hereby give Mid and East Antrim Borough Council / PCSP authority to place my details on a computerised database system. In accordance with the Data Protection Act 1998 we have a duty to protect the information which we hold about you. The information provided will be used for the Text Alert Scheme only and will not be shared with any other organisation without prior permission.